A stunning Gnome & Fairy Door at the trunk of your favorite tree will create a lovely and imaginative home setting for your gnomes & fairies. 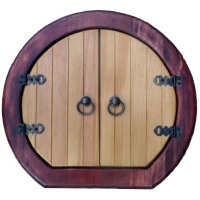 Made of real teak wood with actual handles and hinges on doors! Size: 13"H x 14.25"W Door / Optional planter windows: 8.5"H x 6"W.